July 10, 2017, 8:30 a.m.
By Joseph Lichterman @ylichterman July 10, 2017, 8:30 a.m. 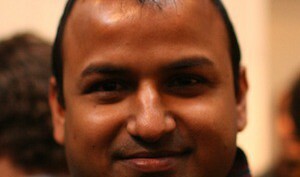 If you’ve spent even a little bit of time on Media Twitter, you’re probably familiar with Rafat Ali. Ali, the cofounder and CEO of the travel news site Skift, is a voracious advocate of focused, niche-driven media outlets — which he prefers to frame as vertical media. It’s an approach Ali has taken in leading Skift, which marks its fifth anniversary this month, and in his previous gig, launching the site paidContent, which covered the business of digital media. 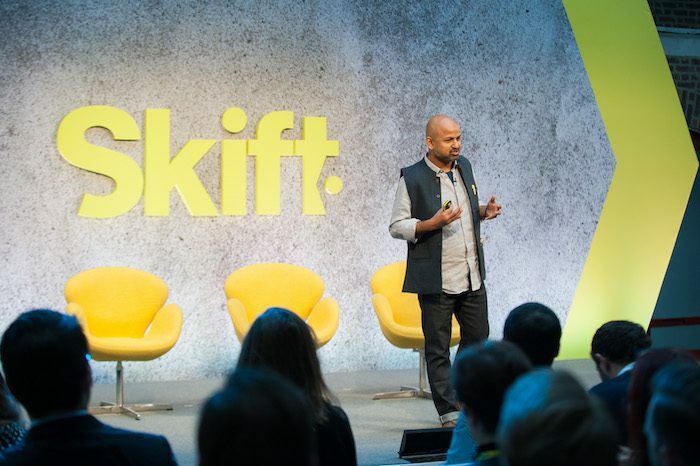 Skift has built its business on three primary revenue streams — a free news site supported by native advertising, a paid research arm, and events — and the company is set to surpass $10 million in revenue next year, Ali said. Advertising and events contribute about 80 percent of Skift’s revenue, with research making up the final 20. Ultimately, Ali said, the company would like each of the components to even out at one-third of the business. Ali and I spoke about how Skift has grown, what’s next for the site, and his support for subject-focused media. Here’s a lightly edited and condensed transcript of our conversation. Joseph Lichterman: Last time Nieman Lab talked with you, it was 2013 and you were growing from five employees to 10. Now you have a team of 40. Can you tell me a bit about how you’ve thought about growth? Rafat Ali: We’re in growth mode in so many ways. We did a lot of hiring over the past year and a half. We’ve certainly more than doubled our team. We have two more full-time hires scheduled for the rest of this year. It just takes a lot of time to hire. I’m happy to be on the other end of it. We are in expansion mode in all senses of that phrase as well. Geographically, we’re putting effort into Europe specifically. Not just because everybody has to do that, but because, in our case, from a travel perspective, Europe is the world’s largest destination as a continent. It gets the most number of visitors anywhere in the world. It’s also where people travel out from — Europeans travel more than anyone in the world. For us, Europe as an editorial coverage area, which also then means as a business focus, is big as we grow. Then in Asia, we’re just beginning, too. We’re looking at doing a conference next year. That’s generally how we move in geographically. We did our first European conference this year in April in London. We’re likely moving it into the continent next year. We’re also expanding from a topic perspective next year — going deeper into some of the subsectors of travel that have a mix of business potential and editorial disruption potential. We’re also expanding beyond travel into what we think is a very adjacent vertical, the business of dining. It’s essentially restaurants and innovation, restaurants and tech, and changes in behavior and customer experience. We bought this newsletter, Chefs+Tech, last year. My cofounder Jason [Clampet] is now spending a majority of his time on Chefs+Tech — or he is in the process of spending a majority of his time on it, which we’re also renaming because Chefs+Tech is an existing newsletter that we bought and boxes us into just tech, which it’s not — it’s tech and innovation, user experience, customer habits, and stuff. We’re still trying to figure out what its name is going to be. Expansion in all possible ways — but it’s still managed expansion. We’re not venture-funded at this stage. We’re venture-funded from a historical legacy perspective, but we’re not raising any money. This is all growth from cash flow. Lichterman: You wrote a post last year that outlined that decision to try and move away from venture capital. I was hoping you could elaborate a bit on that thinking and tell me a bit about how it’s gone thus far. Ali: That was written in the end of December 2015 and posted in early January 2016 — almost a year and a half ago at this point. All the things I said in it still hold true. We don’t need the money for organic growth. At some point, if there’s an inorganic growth opportunity — never say never. For instance, if China becomes an opportunity for us — China, you can imagine for every company, but in travel, Chinese travelers are now the world’s largest number of travelers. Going in there would not be easy. It’s not been easy for any media company, so we would have to partner with somebody and potentially need some money to build it out. We haven’t done anything on it — that’s just a hypothetical example. Or if we need to buy some company that we think could fit into either our research division or our content studio division. Then we would need to raise money for it. We don’t have the capital to do that; we have capital to grow on our own. We would raise it on the right circumstances that made sense. We have no plans today — certainly not on any horizon for the next year even. I think in hindsight, a lot of the troubles that a lot of other media companies went through, we went through them a bit earlier than them — two years or three years before them, so we sound like the wise guy now. It clarified a lot of things for us in terms of the direct relationship with users, which now has become a fashionable thing to say, but we’ve been doing it for a while. I wrote an internal memo earlier this year and the title was “2017 is the year of the Skift subscriber.” Subscriber for us means anybody who is an email daily newsletter subscriber — and we now have six other newsletters beyond the daily newsletter, these are specialty newsletters within travel. Anybody who has an email relationship with us, and anybody who has a paid relationship with us — the research subscribers, which typically come out of the pool of the email subscribers. There will likely be an email subscriber that will convert to a paid subscriber. A lot of focus for the last six months has been getting more data on our existing base of users. We are at the end of a four-month-long project on essentially data enhancement. We have emails from all these people — now how do we get more understanding of which industry they’re in, what titles the have? Initially, we didn’t ask for a lot of information beyond email address, but now we’ve wisened up and standardized the data. Any form on Skift will ask for X number of fields now. We now know more about our users: Are they a meeting planner? 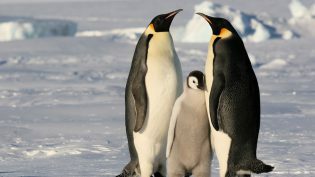 Are they a corporate travel buyer? Are they a hotel manager? Are they a travel agent? Are they a tour operator? Do they work in digital marketing for Priceline or Expedia? That helps us, as you can imagine, in a million different ways from a business perspective. Understanding and getting the data on our existing subscribers and standardizing the data going ahead. Then being able to seamlessly move that data between [programs]. For our sales team, we use Salesforce, for our marketing and email newsletters we use HubSpot — moving data among all the backend systems. For our subscriptions, we use a semi-inbuilt but third-party software that we have totally optimized — that’s our subscription management software for our research. Moving data between all the systems has been a big of what we’ve been doing this year. We are in a position, long story short, to have the luxury to do the things that will help us build for the next five years. A big part is understanding, segmenting, and customizing the users we have. We are the largest industry news site in the travel industry. That’s great. We achieved that 18 months in. But, as we grow bigger and bigger, sponsors are asking for more quantifiable data beyond just being big. This is a big part of what we are — a big part of our revenue is advertising, but we don’t do typical advertising. It’s pretty much 100 percent branded content. We need understanding of our users. Our editorial needs understanding of our users to be able to figure out what sectors do we need more specialized coverage in. We’re likely going to hire a couple of more specialized editorial people — not this year, but early next year sometime. Lichterman: You mentioned additional verticals and Chef+Tech, but what else might we expect to see on the horizon? Ali: All the stuff that we’ve done with Skift we expect to do with whatever Chef+Tech is going to be called. If we do change the name, it’s probably going to be in the next two to three months and with a new design. Right now, it’s just a newsletter site. We moved from a weekly to a twice-a-week newsletter in the past month. By the end of a year, it’s going to be a daily newsletter and daily coverage of the industry. We’re not going to focus on sales for the first year. That’s exactly the script we followed with Skift. Back then, we had raised a little bit of money at the start, and now we have our own money. We weren’t focused on sales for the first year. But at our Skift Global Forum — which really has become the biggest conference in the travel industry, and this year, and (obviously, this is me saying it, but) the speaker lineup is kind of mindblowing — we’re adding also food speakers. Danny Meyer is speaking this year. We’re adding some of the food element at our main conference. And at some point by next year, probably, it’ll be a full-day conference that’s maybe just a day before the main Skift conference. We’re going to start doing research next year at some point as well for the food vertical. Food for us — it’s not all food. It’s restaurants, meaning dining out. That’s our focus. We’ll add research, we’ll add video, content studio, etc. We’ll do everything we did with Skift to make it as big, if hopefully not more. My sense is that it has a larger audience, because people dine out more than they travel. I think there may be a bigger audience industry-wise in dining out. It has similar characteristics to travel. When we entered, there were obviously a lot of trades that have existed forever. It’s actually not as bad as travel was when we entered travel, so we certainly have our path cut out for us. So we’re doing that. I have my eye on one more vertical long-term. One is related to another, as you can imagine. Travel and dining are very complementary sectors. And I’m thinking retail — but I don’t know what that means beyond just saying “luxury retail” maybe at somepoint. I have no idea what that means at this point beyond just that phrase. That may become a part of it. You can imagine that, between these three sectors, this is where most of the disposable income for consumers is spent. If we become the pre-eminent business information company that focuses on the largest portion of consumer disposable income — meaning travel, dining, and luxury retail — that’s a powerful thing to build. That’s the goal for the next five years, if anybody is going to ask me that. Lichterman: Skift has those three main buckets in terms of revenue: the free news site, supported by advertising, the paid research, and then the events. One of the interesting things I thought you’ve done recently is offer early access to your stories for paying subscribers. I’m curious how you’re thinking about those three areas and how they fit together and how they’re impacting the business. Ali: We just launched it, so I don’t have enough information to say all of this is working fabulously well. It’s not a short-term bet, anyway — it’s a long-term bet. Historically, subscriptions and free are hard to build side-by-side. Or it’s primarily a subscription that has a free gateway — you know how many examples there are, the Times, the FT, the Journal, and others. We have existing free, robust, daily coverage of the travel industry, monetized through branded content. Then we have the research. Over the past year, we’ve built from five full-time people, soon to be six. And, in addition, 10 people in editorial. They can’t be divorced from each other. Both from a coverage perspective and from a business perspective. The free should not be cannibalizing the paid. Early access is an attempt to solve that problem, and a lot of our daily stories are substantial, market-moving stories. I don’t mean market-moving in the sense of financial stock market moving — I mean in terms of material information for companies in the travel industry. We do a lot of CEO interviews, and a lot of times, they share a lot of material information about their business that other competitive companies would like to know first. We think there’s a lot of valuable information that our daily free coverage has that subscribers who pay us anywhere from $1,795 for a year for an individual subscription to as much as $35,000 to $50,000 for an enterprise subscription should have early access to. I know this is cliché to say, but there are a lot of lessons to learn from Amazon Prime that certainly we’re learning. Don’t create multiple subscription services — focus on one and build as much value into it. You can keep increasing the price depending on what value you build into it. That’s kind of our strategy. We’re not going to have a subscription service separate for hotel industry or airline industry or marketing people. It’s a single subscription service, a single price, that will have multiple things in it. We do 20 research reports per year, and then we’ve added analyst calls that we do once a month. Our analysts do a webinar kind of thing. Then we just added something called data sheets, which is original raw data that goes into the research. We’re now offering it for people to download as an Excel file. We’re going to add more of this stuff. We just did this early access — they can get stories get as much as a day, sometimes a couple of days, earlier than free subscribers. That window may increase if it’s not a particularly newsy article but it is material information. So we’re going to continue to build stuff. We’re looking at integrating a third-party data service as part of the research service. It’s originally someone else’s, but our user base is a much bigger sales channel for this company that we’re tying up with potentially. So we’ll be able to offer that data service as part of our research service as well. Not charging anything separately, but just continuing to add value — and we’ll obviously increase prices as we put more value into it. That’s the strategy with early access and subscribers in general. It doesn’t certainly affect anything on the advertising side — it’s not that our pageviews are going to come down, and in general our advertising is not dependent on pageviews anyway. We need to have a base of daily users coming to Skift for branded content to continue to be viable. Lichterman: I wanted to follow up quickly on something you mentioned earlier in terms of thinking about geographic growth and using the events and the Global Forum as a way to penetrate new markets. I’m curious about the thinking behind that and why do you want to base expansion off of events. Ali: Events are certainly one-off. So you go in and if it fails, it fails one time and you’re done, right? Versus setting up an office. When we started Skift Global Forum in 2014, we put the word global in there. Did we have any idea it was going to be global? No. Was it global year one? Not really. But sort of claimed a mantle — it’s going to be global some day. It turns out it was certainly a lot more global than we expected in terms of attendees coming from various parts. Last year, there were 35 different countries — a majority U.S., but 35 different countries — in New York. We just did our European conference and there were 26 or 27 different countries, including people from the U.S. who came from it. The business of travel is global, and events tend to have an in-built business model. I’m not giving you any secret — everybody understands this. There are two business models in it: the ticket sales and the sponsorship stuff. It’s an age-old business model that works. We know how to get speakers. Any region we go into, we can get speakers. Our clout now is so much that we can instantly become the most high-level conference anywhere we go. Guaranteed. We did our year one conference in London this year and we got big names that for a year one conference was unheard of. We’re going to Asia next year, if we do it. We’re still a couple weeks away from finalizing that decision for Asia next year. We’ll instantly get the biggest speakers we need there. Biggest stokes our ego, sure, but it’s also it’s a really strong strategy in terms of entering an area and showing our editorial clout, which then helps us build our business clout. That’s the strategy. For Europe, what we did was we hired an editorial person about six or eight months earlier than the forum. And now our U.K./Europe editor, Patrick Whyte, he’s there full-time covering it. We hired a sales person — she came on board with the conference. Ideally, we would’ve liked her to have started six months before, but we couldn’t find the right person. The sales for the London European conference was done by our U.S. sales team. It worked out fine. For our Asia one, we’re trying to figure out Singapore, or maybe Dubai or Abu Dhabi. We’re trying to make that decision in the next two weeks. We may hire somebody editorially six or eight months earlier — if it’s Singapore, it’s going to be someone in Singapore, and if you do Dubai or Abu Dhabi it’s likely going to be somebody in Dubai. That person then becomes a full-time person. You start building the coverage area and then the conference comes a few months later, and then you start building the business. That’s how we’ve seen the progress happen. Lichterman: The last thing I wanted to ask about is that you’ve been a vocal proponent for vertical media and this type of coverage. Why have you made such an emphasis on that and have you learned anything from the process? Ali: I’ve spent my life in vertical media — you know different people can call it anything they want, but focused media, niche media, subject-matter media. Vertical media doesn’t have to be just B2B — it’s also B2C. It’s subject-matter-focused media, as opposed to a generalist media company. There’s an opportunity to go deep and create direct relationships with users. That’s what I’ve advocated. You’re not dependent on platforms or any other thing to build your brand. That’s been a big focus for us, and certainly that’s what I evangelize. There’s a lot of innovation happening in vertical that doesn’t get covered by a lot of other media. I know Nieman Lab covers a lot, but the general mainstream media or media reporters in general — everything BuzzFeed does, or Vice, or Vox gets covered a lot. But there’s a ton of innovation happening in smaller companies. One of the things that we’ve evangelized for a while is that there’s a more meaningful life for journalists and media people in general at these smaller companies than at a very large churn-and-burn type environment that exists at many of the names I just told you. We emphasize a lot about culture at Skift. People don’t really leave Skift. Coming up on two-and-a-half years, nobody has left Skift willingly as an employee. Obviously, you hire people and some people don’t work out, so firing has happened, but nobody has left Skift willingly. Which is a mindblowing thing if you look at any other company. That’s because we put so much emphasis on work-life balance: 9:30 to 5:30 work hours, which is an unachievable goal. You’ll never be able to complete your work between 9:30 and 5:30 — but if you aim for it constantly, you’re somewhat close to it. Most of the people actually do get to do 9:30 to 5:30. Editorial tends to more, just because of the nature of the job — but even then, we try to cut back, cut back, cut back. That’s kind of my mantra: Editorial, you don’t have to churn. We’re not evaluating you based on the number of stories you’re doing, so why are you just filling the pipe? We’ve cut back a lot in terms of volume, even though we’re going deeper because there are more people. We’re creating more content, but in a meaningful way and in different sectors, as opposed to just doing for the sake of doing. All of that creates a more meaningful environment, not just in our company but in other companies in that Vertical Collective group, both B2B and B2C, like Food52, the food site, Fatherly, which you guys have covered, which is growing at a pretty dramatic pace now. They’re consumer, and there are very smart people behind it. In the B2B side, it’s us or Business of Fashion, which is based out of the U.K. They actually completely moved to a subscription service and now they’re really focused on subscribers. There’s a lot of meaningful innovation happening in these companies that doesn’t get highlighted as much. That’s why I evangelize it so much on Twitter and in general. It’s what we live and breathe at Skift: We’re constantly launching new things. We have these 10 core values — which by the way, we’re editing down to six because I think 10 is too much. The first core value is this: Fresh, design-forward, and always launching new things. That’s our first core value. That’s essentially what we do. Our point of view is fresh; our goal for the next five years is to keep it fresh. We’ll always be design-forward for being a small company. We don’t have the budget that Vox has, but for what we are, we’re very design-forward. We continue to embrace the new, and new things from a publishing-technology perspective. And we’re always launching new things. One of the things that we try to do, and I think it has worked well for us, is to surprise and delight. Surprise and delight is a marketing tactic. In our case, it’s essentially constantly launching new things so that the industry is constantly surprised. Hence we are fresh in people’s minds, hence we can continue to build a business that people look to as relevant for the future. That’s worked for us. POSTED July 10, 2017, 8:30 a.m.